Stripped free of decorative embellishments and extraneous detail, the Sonnet beautifully expresses the art of the ceiling fan at its most basic and elemental. The sleek Satin Brass housing accommodates the extraordinary clear acrylic blades and LED lighting. 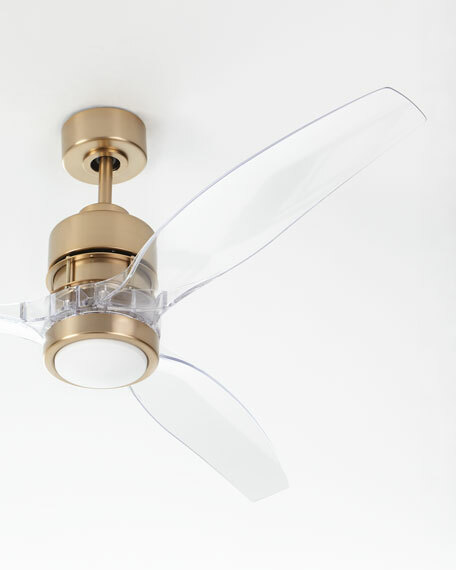 Ceiling fan powered by a six speed Energy Efficient DC motor with clear acrylic blades and dual remote controls. Steel motor finished in stain brass finish. LED light kit that uses 14-watts to produce 1,380 lumens of light an equivalent to a 100 watt incandescent light bulb.